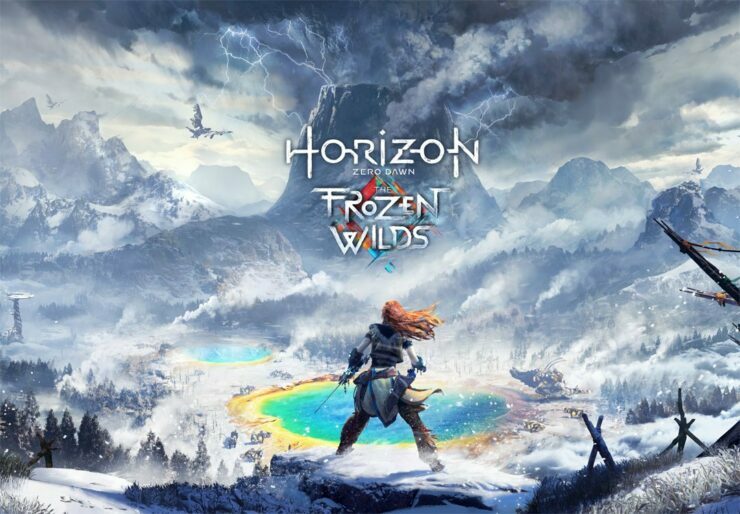 The location of Guerrilla Games’ Horizon Zero Dawn Frozen Wilds DLC might well be based upon Yellowstone National Park if GamesRadar is to be believed. That what the gaming site believes after analyzing the expansion’s E3 trailer that Sony debuted last month. The new location in Guerrilla’s masterpiece is said to be Ban-Ur – the nomadic homeland of the Banuk, situated to the north of the Sacred Lands and the Sundom. Ban-Ur has been mentioned in the main game on several occasions, but has yet been unexplored by the red-haired Aloy. The artwork that was released for the expansion also shares similarities with the national park known for its wildlife and geothermal features – the largest hot spring in the U.S., the Grand Prismatic Spring, can easily be discerned in the art (up above). One thing we can be 100% certain about is that this robot has never been seen before. It has broad shoulders on a short body, a bulky belly, and a relatively small head that looks to be split in the middle like Horizon’s Scrapper robot. Sure, it would be pleasantly fitting for it to be a bear seeing as Yellowstone is full of the fluffy, teethy predators. Native American lore also says Devils Tower was created by a bear clawing up its side, so it would make sense. The wide, heavy belly that hangs below the shoulders, and the way the robot moves by simultaneously pushing off its hind legs makes it looks suspiciously like a gorilla. The reaching digits on its left hand as it lands in the snow also look like fingers rather than paws, which would fit the idea of an ape. Either way, there’s a glint of blue on its black (rather than green, which is typically the colour of blaze) so whatever the giant mechanised creature is, it’s probably got a frosty attack that uses the sparkling azure chillwater. We’re pretty excited for the upcoming Horizon Zero Dawn expansion, and are pretty sure that a lot of fans are waiting for a new Aloy adventure. Horizon Zero Dawn : The Frozen Wilds is slated for a release later this year on PS4.